Disclosure: One of the authors did send my a copy for free. This (German language) book is a very unique book. It only deals with so-called Hybrid bank capital which clearly could be called a “distressed asset class”. Hybrid bank capital before the financial crisis was a “win-win-win”: Banks liked it because they could replace expensive equity capital and buy back shares. Regulators gave happily credit for it because the banks told them that if there would be trouble, those instruments would behave as equity. Investors were happy, because the banks told them that if there is trouble, the bonds will always pay because they were bonds. Well, after the financial crisis, it was suddenly “loose-loose-loose”: The banks did not get equity credit anymore, the regulators were pissed of and a lot of bond investors were suddenly owning very equity like investments. 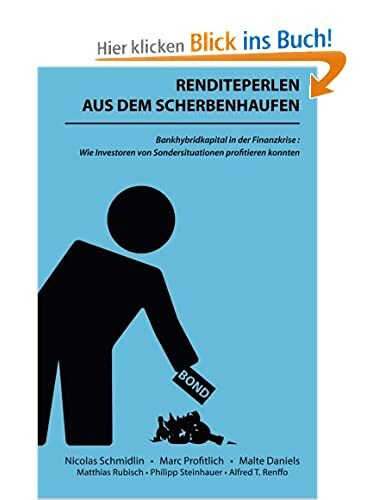 “Renditperlen aus dem Scherbenhaufen” is a collection of case studies about a couple of those hybrid bonds which traded at very attractive levels at various points in times. The special thing about this book is that it is written by individual investors which are active on at least one of the many German internet message boards. Nevertheless (or because of this ? ), the case studies are better quality than anything you will ever read in analyst reports, newspapers etc. There is a lot of extremely valuable knowledge in the book plus a lot of background about the capital structure of banks. When the book was released, some of the case studies were still “active” and generated very attractive outcomes since then. For beginners, it is maybe a little bit too detailed, but for investors which like to increase their circle of competence, it is a must read in my opinion. Also for anyone wanting to buy a banking stock, this book will give a lot of insight how the balance sheet of a bank works. The only drawback is that it is only available in German. And no, I don’t get any money if you click the link and buy…. Ich habe mir das Buch aufgrund dieser begeisterten Rezension gekauft und war ebenfalls begeistert. Als blutiger Anleihenlaie, der sich bislang bestenfalls mit Bundesschatzbriefen beschäftigt hat, war ich ja sehr skeptisch, ob und wieweit ich dieses Buch verstehen würde. – Ein Anreiz, gerade bei zukünftigen Turn-Around-Stories von AGs nicht nur auf die Aktie, sondern auch auf börsennotierte Anleihen zu achten – vielleicht finden sich hier bessere Möglichkeiten zu niedrigerem Risiko. – Die Komplexität vieler Sonderklauseln und die häufige Erwähnung der Notwendigkeit einer gerichtlichen Klärung von unterschiedlichen Auffassungen zeigte auch sehr deutlich, auf welcher professionellen Ebene einige dieser Spekulationen stattfanden – kaum das richtige für Amateure wie mich.
– Mit 12,95€ für über 200 Seiten bei voraussichtlich geringer Auflage ein geradezu unglaublich günstiges Buch. Dann akzeptiere ich auch gerne Amazon als Herausgeber und einziger Vertriebsschiene. Reich wurden die Autoren damit sicherlich nicht. Und wenn ich mir die Entwicklung der wenigen, zum Veröffentlichungszeitraum noch offenen Spekulationen richtig angesehen habe, scheint das Veröffentlichungsdatum die Kurse auch nicht relevant getriggert zu haben, so dass man auch hier nicht von einer pekuniären Belohnung reden kann. Der Trigger kam erst durch entsprechende Gerichtsurteile. Vielen Dank den Autorenfür dieses spannende Buch! Ich freue mich schon auf Ihr nächstes Projekt! Und vielen Dank dem Rezensenten, der mich hier auf diese Perle aufmerksam machte! Roger, als einer der Autoren: Vielen lieben Dank für die netten Worte. Wenn du magst, würden wir uns natürlich auch sehr über eine kurze Rezension auf Amazon.de freuen! A while back, I read the book as well and found it very insightful. But my conclusion was, that most of these situations open up only during distressed times when equities are generally (based on expected return) the much more favorable medium of investment. Additionally, I really disliked the regulatory and legal tail-risk as a few examples clearly demonstrated. In distressed times, even high quality stocks (low risk) become ridiculously cheap and since the upside with most of these bonds is limited (excl. convertibles etc) I believe equities offer the best form of investment. In the end this is of course dependent on the individual security issues. I agree though that with the actual “special situations”, i.e. the company is distressed/inefficient and not necessarily the market, the regulatory risk goes down (as the government does not need to avert armageddon) and the situation might offer an attractive yield & diversification on-top of the usual portfolio. yes, we published independently. The reason behind this approach was that one of us, namely Nicolas Schmidlin, author of Unternehmensbewertung & Kennzahlenanalyse, had good experience with this approach. Since the authors did this as a side project, we were not willing to spend time and effort on pitching the book to a range of publishers. However, independent publishers also differ quite a bit in terms of distribution channels, quallity, availability and price. Although the book is only available on Amazon the costs factor strongly favored this provider. By the way, ordering: I tried to order it at my local stationary german bookdealer, as I usually try with german books, but they were not able to get it. So I had to order it at amazon. The publisher seems to be really small or strange that it cannot be ordered stationary. Or did I miss any imprtant information? it is a self published via Amazon. That is the main reason why book publishers are not happy about Amazon. Cutting out the middleman…..
Amazon is the publisher? Wow, they seem to make everything. If it helps to realize such low prizes for a book with a probably quite low print run, there are few reasons to complain about. 13€ is really a bargain. Thanks for the offering of this book. A while ago, I considered to buy it, but had not glanced into the contents, now I did and ordered it. Especially the hint, that it is helpful for a general better understanding of bank balance sheets, convinced me. I’m also pleased to have a second encounter with the “DEPFA-Genüsse”.